Every workplace and job position carry their own set of unique stressors. The mortuary field is no different. No matter how many funerals you direct, how many families you help with arrangements, or how many bodies you embalm or place into their final resting place, a career in the mortuary industry carries with it some very stressful trappings. From grieving families to the stress of being around the bodies themselves daily, there are many situations and experiences that mortuary workers suppress that aren’t exactly natural. You can train yourself to be positive and look at all the ways you are helping families and think about the difference you are making for others. But, as with any job, at some point, the stress catches up with you, and you may realize you must find a way to shut off the pressure. All of us need an escape at one point or another. In a recent study called “Attitudes in the American Workplace” that was conducted by stress.org, 80% of all Americans feel stress on the job, and more than half of them say they need help in learning how to deal with it. You are not alone. What might be surprising is that it’s not always working with death that is the true issue. Often what is truly impacting workers in the mortuary industry is a common workplace agitator. It could be that you are working long hours (and non-traditional hours at that). As we know, the mortuary business is not always a 9-5 environment. But in that stress.org study, it was found that the average American is working about 47 hours a week, and 20% of all Americans are working 49 or more hours (stress.org). Maybe it's a co-worker or a boss that you don't get along with. 29% of those surveyed said that they had yelled at a co-worker due to stress, and 42% said that yelling or other verbal abuse is common at their job (stress.org). The stress of those long hours and demanding environments is taking its toll on the American workplace. So, how can you reduce your stress while working in a traditionally stressful industry like mortuary services? Whether you are at a funeral home, crematorium, cemetery or even a mortuary shipping company like ours, we’ve got some ways to reduce the stress and increase the productivity at your place of business. Talk about the tough ones. No matter how long you've been in the mortuary game, there are always the "tough ones." Children who pass away leaving behind grieving families. Military or civil service heroes who pass on while putting themselves in harm’s way to protect us. Friends and community leaders with whom we have close ties. There are simply some funerals that are tougher than others. It’s okay to admit that we are stressed out by those rough arrangements. Funeral industry workers are human. You can put on a calm front for your families that are counting on you, but when you get a chance to be alone or away from your clients, it’s your turn to grieve. Talking about the situation with your staff or colleagues in the industry can really help eliminate those dreadful feelings. It can be hard for family to relate, but you know they will listen if you give them a chance. Above all else, get it off your chest, no matter whose shoulder it is that you are crying on. Stress relief starts with communication. Take some time to get away from it all. Would you believe that 55% of American workers fail to use all their vacation time (cbsnews.com)? We all tend to think that the business will collapse if we are gone for a few days, but the reality is that the world spins no matter which corner of it we are visiting. The key is to take a vacation that gets you away and truly isolated for a longer period than just a recharge weekend would allow. Quick trips are great too, but we all need that one longer vacation that will allow us to shut off the world for an extended time. It's also great to find something all-inclusive so you don't have to make as many decisions. Limit yourself to checking emails/texts once a day or, better yet, don't check them at all. Your job will understand, and they will be glad to get a refreshed, eager employee in return! Get out of the room for a while. Working in a crematorium can be extremely grueling. It’s hot, stressful work, and it’s physically demanding, especially in a facility that doesn’t have the most modern equipment. So, what can you do to help daily? Get out when you can during the day. Take a break. Make it a priority to get fresh air and disappear for lunch or a coffee break. Even a 10-minute walk can improve your mind’s ability to tackle the challenges of the rest of your day. You owe it to yourself to get away for a few moments to recompose. One nearly universal trait of all funeral home directors is the idea that they must shoulder the entire burden themselves. Part of this is because they feel that if they can wear every hat at once they can cut down on expenses and stretch that bottom line. What they soon find out is that they get less done, have more unfinished tasks and have more stress in front of clients because it is impossible to get everything done. The solution is easy. Let someone help. You don’t have to do everything. You can also outsource some work. If paying the bills is stressful, hire a bookkeeping firm to help or an account to handle it. 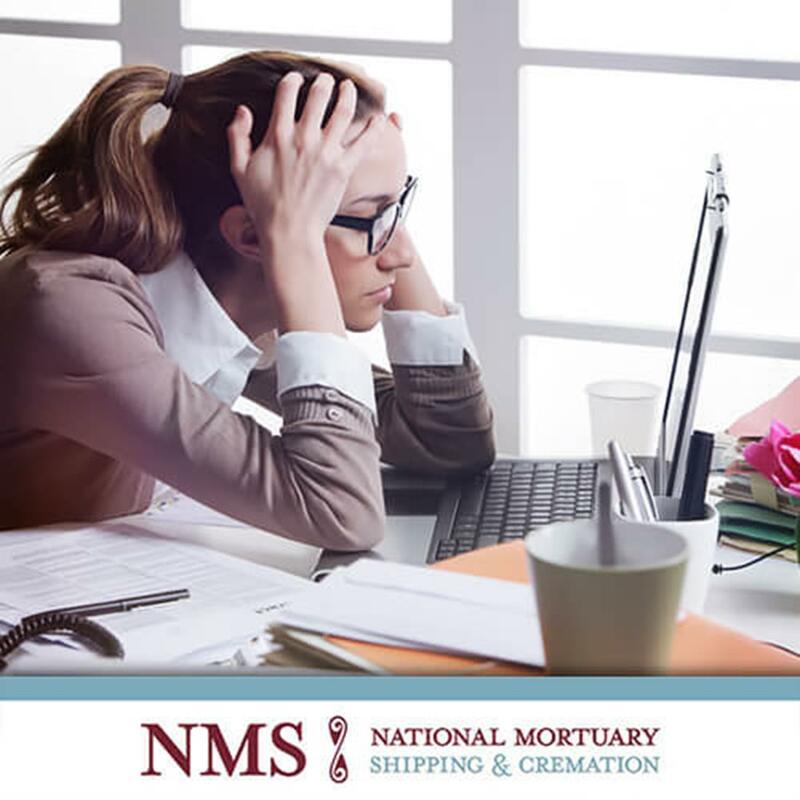 If logistics are an issue, there are services available, National Mortuary Shipping being one, that can help with some of those big-picture issues that you are having so that you can better focus on your clients. A stressed out, overworked funeral director is an inefficient one. You will be more productive and therefore more financially prudent if you let someone else help with some of the tasks that are weighing you down. You are not alone. Almost every worker in America feels it. And, owning your own business doesn't change things. So, if you can’t escape the stressors that come with being a mortuary industry worker or owner, you can at least try these simple techniques to help combat some of the workplace anxiety. Looking for help with some of the more stressful aspects of funeral planning and mortuary logistics? National Mortuary Shipping has been helping people just like you with mortuary planning for over 35 years. Contact us today and download our mobile app to guarantee the most stress-free experience in mortuary shipping. We can't send you on a cruise but can make things easier until you get to take one!